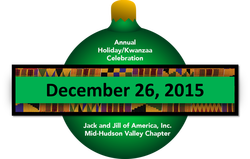 2015-2016 Chapter Events - "The Magnificent Mid-Hudson Valley"
Each year we have three to four major chapter events that are open to the friends and family of the Jack and Jill Mid Hudson Valley Chapter. From fundraising to fellowship, each event provides wonderful opportunities for our children to share unique experiences, celebrate their friendship and build lasting relationships. Purchase tickets or request an invitation to our upcoming events to be added to our mailing list. An afternoon of fun and festivities to welcome back our families, engage with our community and say hello to prospective families who will enter the MHV fold. Each year we celebrate the holidays with a Kwanzaa celebration that embodies the seven principles. Fun for the whole family, our teens lead the charge followed by themed entertainment, activities for the children and dinner and dancing for everyone. Every two years, we raise funds for the Jack and Jill Foundation or America and our local charities to support the programs and initiatives that make our organization and communities thrive. Request an invite to these events. Supporting our community is of prime importance to the Mid-Hudson Valley Chapter. Therefore, we strive to be of service in as many meaningful ways possible. From clothing drives to soup kitchens to on-site visits, we aim to make an impact to children throughout the Mid-Hudson Valley. Learn about our this year's community service projects. Legislative advocacy is a cornerstone of Jack and Jill. As such, we work to support National initiatives that affect healthcare, education, juvenile justice and gun violence. Our goals is to respond to the needs of our country and our local communities by pooling our collective voices to effect positive change. Learn about our legislative initiatives for this year.